Kettler table tennis special offer set: Great saving of more than 20 Euros compared to German RRP for single purchases ! Resistant synthetics material protects from humidity, dust, and dirt. If you wish to get playing balls in orange colour, please enter this in the comment box on our website (last page of ordering process). For each table tennis board of Kettler, the Kettler table tennis accessory special offer set is recommended. 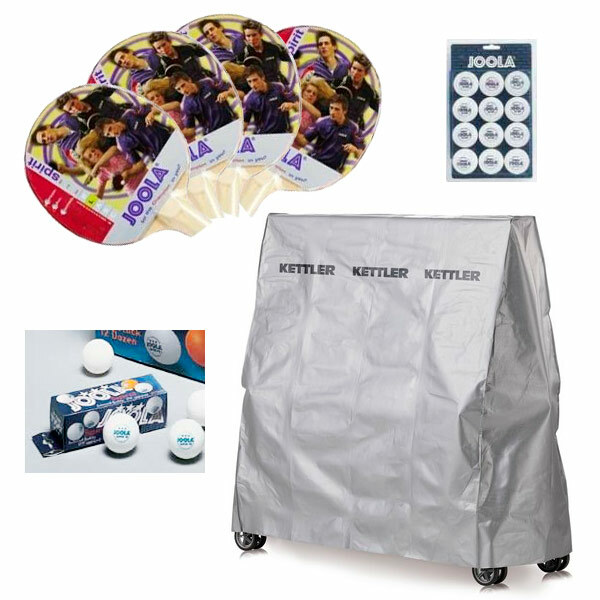 This special offer set includes the high-quality Kettler cover, protecting your table tennis table from dust, dirt, and humidity. Cover increases lifespan of your table tennis table. Four stable table tennis bats for leisure players as well as 15 table tennis balls of brand manufacturer Joola are provided in delivery, of it three competition and club balls, which are determined as official playing balls of many ProTour tournaments because of their excellent ball bounce features - for quick starting. Get great saving of more than 20 Euros compared to German RRPs for single purchases with the Kettler table tennis accessory special offer set - order your accessory set for your table tennis board right now !